Natural, organic products are all the rage in the newly health-conscious world we live in and, be it food, drink, clothing or even beauty products. Most of the beauty products we buy today are there because they are inexpensive to produce, therefore full of carcinogens and other ingredients that disrupt the well-being of our skin. Whatever our skin absorbs effects our overall health. Everyone wants to look and feel great, and organic skincare may be just the ticket. Using natural beauty products helps our skin absorb essential nutrients that nourish our pores instead of irritating the surface, causing redness, blemishes, and dryness. A lot of the products we use to banish blemishes are actually the culprits for causing further irritation and wreaking havoc on our sensitive dermis. Our face is our most beloved skin and shows the most imperfections, so we tend to focus more attention on this area, so we need beauty products that are good for our skin and won’t disrupt our natural radiance. That’s where Beauty by Earth comes in. Beauty by Earth is a natural, organic beauty company with products developed for lips, hair, body care and facial skin. Everything from Beauty by Earth is made with skin-loving ingredients and natural flavors that strip the boring right out of your beauty routine. If you have ever read the list of ingredients on the products you use, you know that you probably can’t pronounce most of them and have never heard of them. You would be shocked to find out how many of those ingredients used to enhance your beauty are actually toxic. At Beauty by Earth, they know the benefits of nature, and that’s why all of their products are formulated without toxins that might disrupt your natural chemistry. 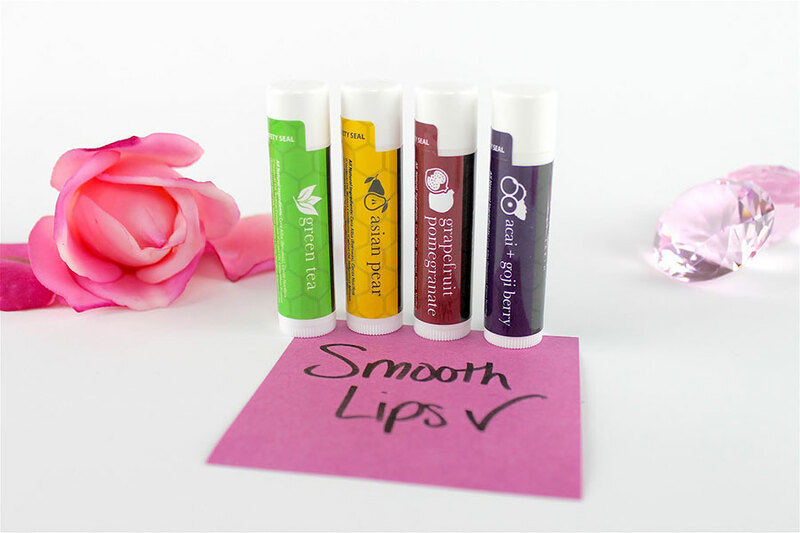 Some of our favorite products from Beauty by Earth are its many natural lip balms. The multi-flavored lip balms are all natural, soy-free, petroleum-free, filler-free, and free of artificial flavors and colors. The beeswax natural superfruit lip balms help protect lips year round from environmental elements, dryness and chapping. Choose from a smoothing pomegranate, Asian pear, acai, or green tea recipe made with beeswax, coconut oil, lanolin, and shea butter to keep you smiling all the time. Everyone wants their lips to look and feel kissable, and now they can be soft and supple while tasting kissable with just the right splash of natural zest. Want to sweeten the pot? Go with our favorite, Honey Vanilla Bean Lip Balm. It’s the perfect way to paint on that sweet smile. It tastes and smells sweet, and softens lips making it the perfect natural additive to your kissable pout. The Beauty by Earth lip balms are not only good for your health but the environment too. Nature is never disrupted whether it be on Earth or within you. 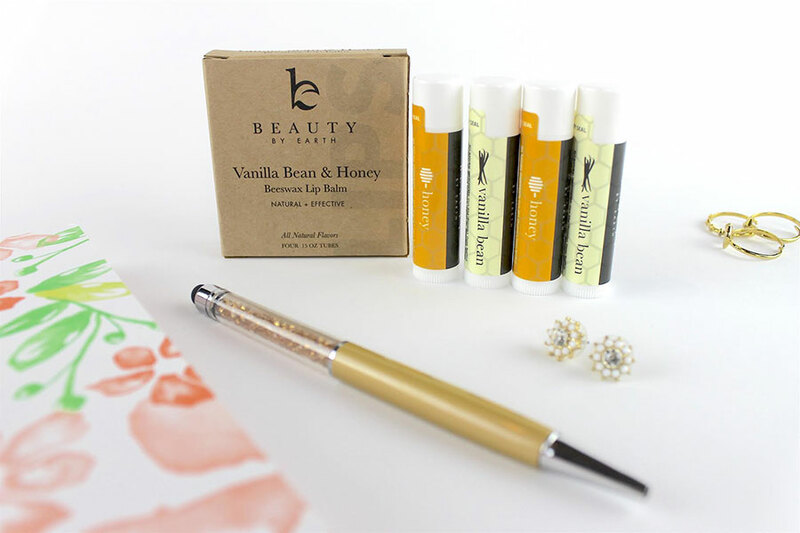 The Honey Vanilla Bean Lip Balm tastes like heaven, so you’ll want to share it with someone special. It’s great for a date night or a romantic night in with your sweetheart. This smooth operator comes in a 4-pack with two honey and two vanilla bean balms, so you can wear the flavors alone or smooth them out together for the ultimate sweet dream. Once you’ve experienced the tasty goodness of Beauty by Earth’s lip balms, the next step is to make your skin just as soft with the Konjac Sponge. This sponge is used to exfoliate dead skin cells, exposing a smoother, softer exterior, making your skin the perfect canvas for makeup application, tanning products or moisturizing. 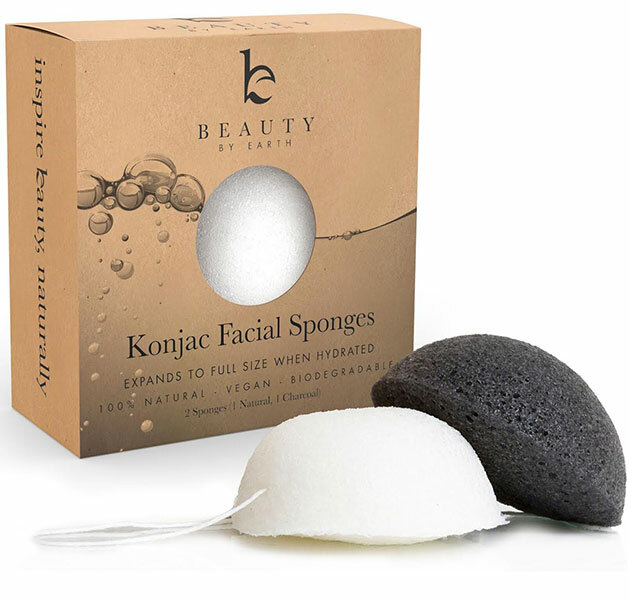 Like your beauty blender sponge you probably have at home, the Konjac Sponge should not be used unless wet. The sponge on its own is dry and hard, not a surface that you would want to rub against your delicate skin, but when soaked in warm water for up to a minute it becomes saturated and soft – ready to exfoliate and reveal new skin. To use, rub into facial skin and decollate in circular motions. You may use a facial cleanser with your sponge, but it is not necessary. Always avoid blemished or broken areas of the skin, as it may irritate them more. Make sure you keep your sponge clean and store in a well-ventilated area to dry after washing. Use boiling water to sterilize it at least once a week. After you exfoliate, you’ll want to try the Clear-Complexion Hydrating Face Mask. The mask contains kaolin and bentonite clay used to cleanse your pores and organic aloe leaf juice extract to soothe and moisturize. All of the mask ingredients are suitable for all skin types and is the key to helping those with oily, acne-prone skin. The clay clears your pores of excess oil that clogs the shafts and its cream base, moisturizes the skin instead of over-drying like most acne products. Over-drying the skin can cause your pores to overcompensate for the lack of moisture by producing a surplus of oil, leading to sebum that causes breakouts and irritating shine. The Clear-Complexion Hydrating Face Mask is perfect for a deep cleansing, spa-like experience, so just sit back and relax while the product soothes and irradiates your pores of impurities. After treating the skin with a mask, use the Beauty by Earth Facial Toner to cleanse, tone and refresh. The toner contains witch hazel, aloe vera, rosewater and cucumber for a cooling sensation. Unlike most facial toners, this one is formulated without chemicals, parabens or alcohols so that it won’t dry out your skin. 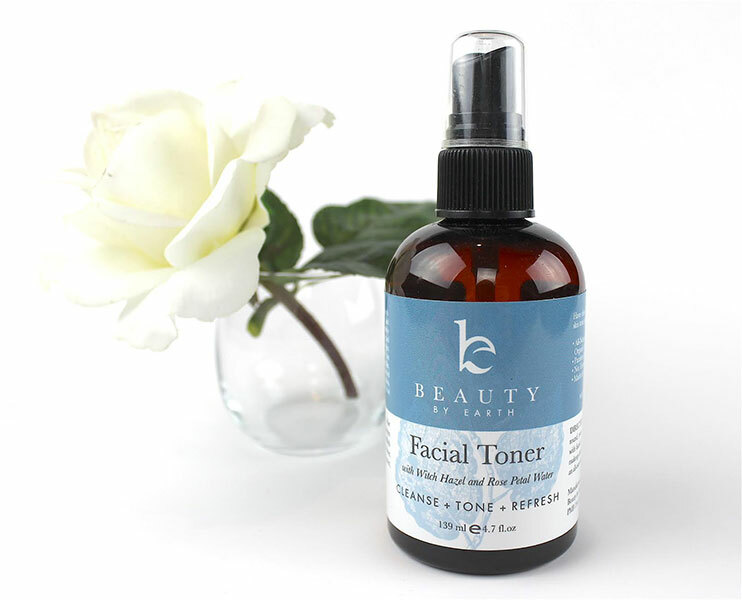 The facial toner is PH balanced, leaves you with smaller pores, clean skin, hydration and a refreshed feeling. It comes in a spray bottle, so you can spray directly onto the skin as a refreshing mist or apply with a cotton round, smoothing all over your face. You can use it as a mist to refresh your daily makeup or even spray all over your body. It can also be used as a natural makeup remover, not to mention the subtle scent of roses surrounding your every move. After you’re done with the Beauty by Earth natural skincare routine, your final step is to moisturize – one of the most important measures of personal care. Whether you’re using the facial mask, exfoliating sponge, lip balms or facial toner, all products are natural, safe and free of toxins. All products work together, step by step to cleanse, tone and moisturize the skin and lips, making the most prominent areas of your skin clear and radiant. To feel your best, you have to look your best and Beauty by Earth can help you do that with its all natural, flavorful product line designed to care for your body in the safest, most effective way possible. Our experts have tried these products, and we have to say, that natural never felt or smelled so good.